The 4x10 Operaview Binocular from Carson is a handheld optic designed for close- to mid-range observations. 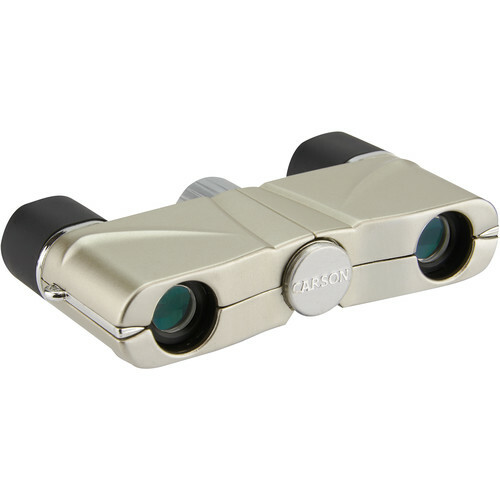 Weighing only 2.2 ounces and featuring a pocket-sized form factor, this compact binocular is easy to handle and makes a great companion for concerts and the theater. The Operaview binocular's 4x magnification will bring the observer closer to the stage while a five foot minimum focus distance enables focus on nearby subjects of interest. Box Dimensions (LxWxH) 4.9 x 2.9 x 1.4"
4x10 Operaview Binocular is rated 3.3 out of 5 by 3. Rated 4 out of 5 by Aud from I am very pleased with these opera glasses. The focus is very clear and sharp. I Iove the convenience of their light weight and pocket size: perfect for Theatre, Opera, Sports events and sightseeing. Rated 3 out of 5 by Fred from Really restricted range of view Just looking at these glasses, you would guess the angle of view is narrow. You would be right. I got these hoping they would be OK for sporting events from the cheap seats. But the tiny field of view means you have to keep re-aiming the glasses even though the power is only 4X. Its like looking down two soda straws. And with only a 10mm objective lens, the performance in dim light is poor also poor. On the positive side, they are really small and light. And what you can see is sharp enough. Rated 3 out of 5 by Greg from Not that great I bought these for a stadium concert but they didn't bring the band in close enough to be good for anything. I suppose you could use them in a smaller performance but then you wouldn't need them. I wouldn't buy them again. My eyes are set quite close together. Are the Carson operaview binoculars adjustable in terms of the distance between my eyes. Yes, they are adjustable so you should be able to accommodate your eyes. Should you receive them and they do not adjust to your satisfaction we do offer our 30 day return/exchange policy. You'd just need to contact our Customer Service Dept within 30 days of the original purchase.